Mid-afternoon traffic moves through the intersection of Main and Water streets in Hellertown, past Borough Hall and Detwiller Plaza. 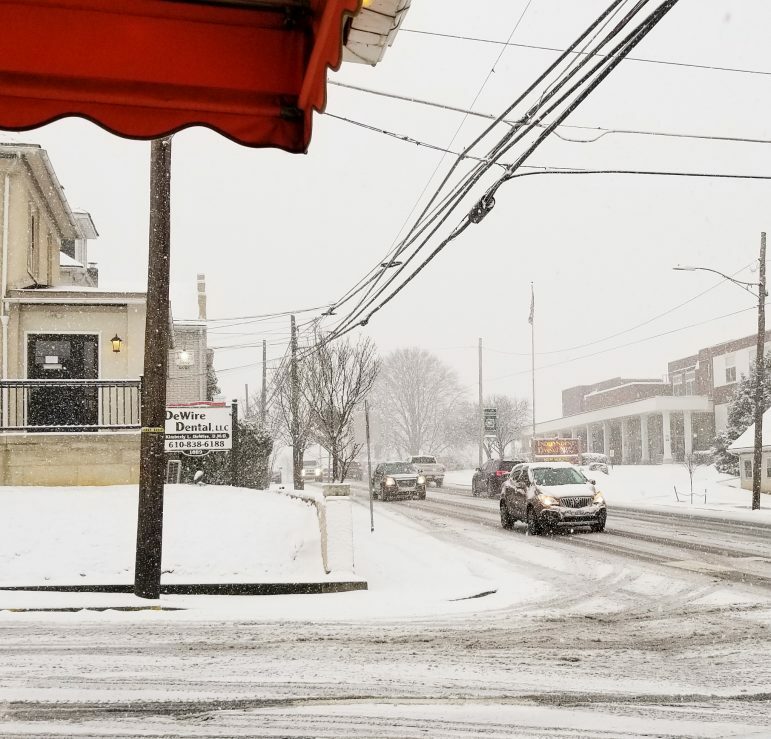 A late January storm brought snow to Saucon Valley Tuesday, with several inches accumulating by the evening rush hour, which was affected by the wintry weather. 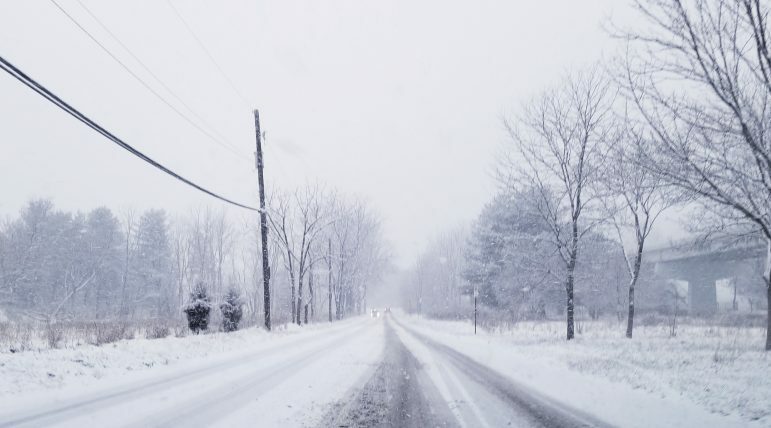 With snow falling moderately to heavily at times, even major roads like Route 378 in Lower Saucon Township became snow-covered and treacherous, particularly for motorists without four-wheel drive. 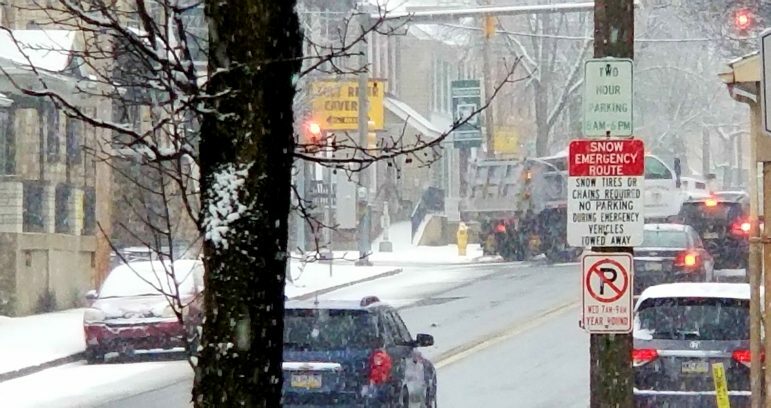 At around 4 p.m. a number of northbound drivers struggled to crest the mountain, and southbound traffic was backing up from the township border with the City of Bethlehem toward Five Points and beyond. 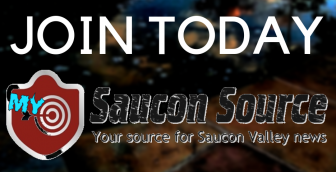 Saucon Valley schools were closed Tuesday, so local roads were free of school buses. However, most businesses were open and just as many workers began to leave, road conditions deteriorated rapidly. 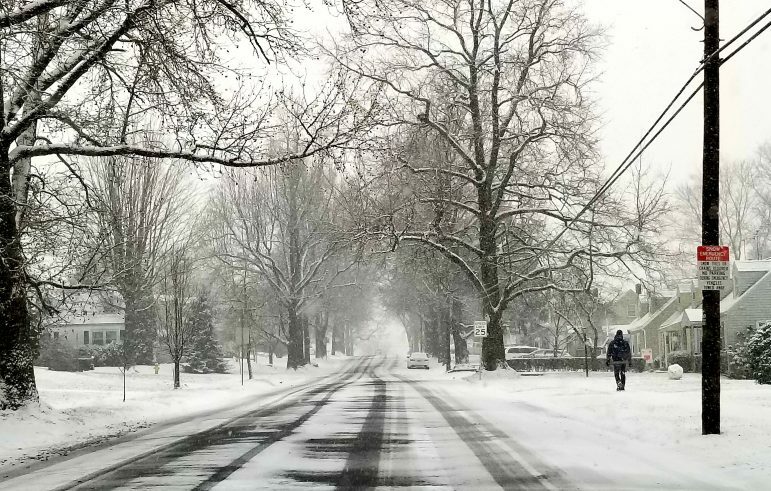 The Lower Saucon Township Police Department issued a warning to motorists to stay off the roads if possible, due to hazardous conditions. Speed limits on interstates in Pennsylvania were reduced to 45 mph because of the storm and the Pennsylvania Department of Transportation temporarily restricted commercial vehicles to the right lane only on the entire section of I-78 in the state, part of which is located in Saucon Valley. By around 8 p.m. the snow was ending across the area, but what fell could quickly freeze solid as temperatures plummet over the next 24 hours. A piece of the polar vortex air mass is descending south into the continental U.S., bringing with it the coldest air parts of the country have experienced in 20 years. Wednesday night’s low temperature is forecast to be 2 degrees, and Thursday’s high temperature is forecast to be just 15 degrees. On Wednesday as the Arctic air invades the area, it could be accompanied by snow showers and squalls, the NWS also warned. Squalls could “result in gusty winds, quick snow accumulation, significantly reduced visibility, and hazardous driving conditions,” a hazardous weather outlook stated. A man walks along Constitution Avenue in Hellertown’s Mountainview neighborhood Tuesday afternoon. 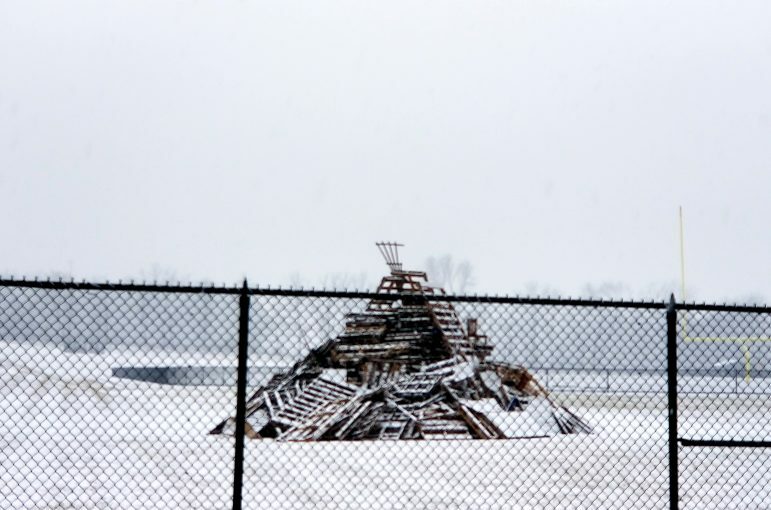 The bonfire built for Saucon Valley High School’s Homecoming celebration in October is covered as snow falls on the school district campus Tuesday. 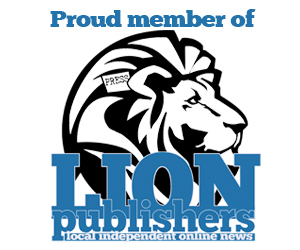 Schools were closed Tuesday, although offices opened. The bonfire was never lit because of rainy weather that resulted in its repeated postponement in the fall. The intersection of Main and Water streets in Hellertown Tuesday, looking east toward the Saucon Manor highrise. 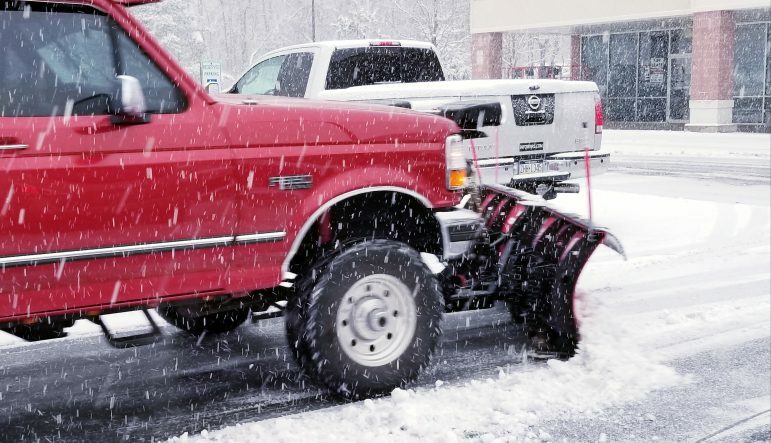 A plow truck clears paths through the parking lot at Giant in the Creekside Marketplace shopping center in Lower Saucon Township Tuesday afternoon. 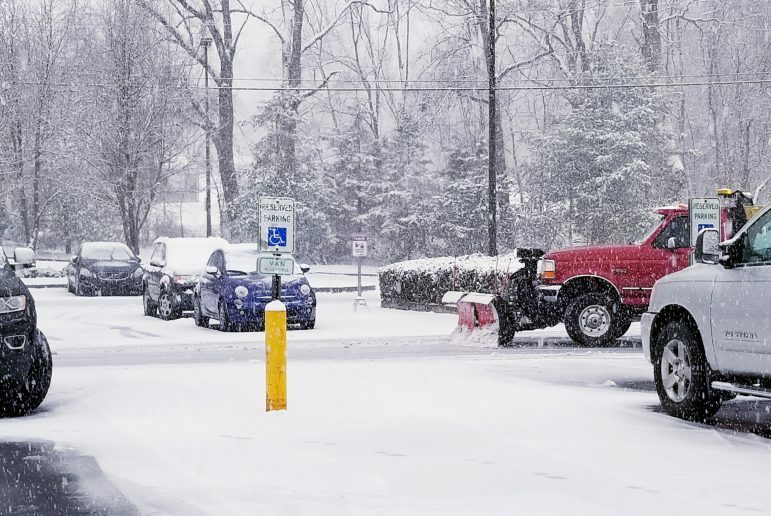 The parking lot at Giant was relatively empty Tuesday afternoon, as snow began to fall more heavily in Lower Saucon. Many stores such as Giant saw a rush of customers earlier Tuesday, before snow began to fall moderately across the area. Slush on roads and sidewalks will quickly harden in the wake of Tuesday’s storm, as temperatures begin to fall to near record levels. 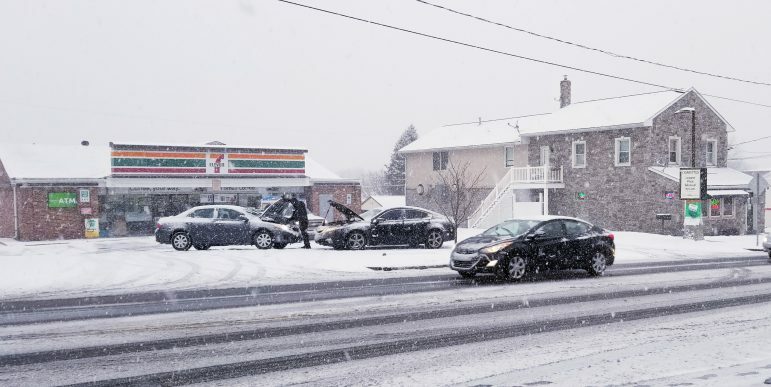 A man uses jumper cables to start a stalled car in the parking lot of 7-Eleven on Main Street in Hellertown Tuesday afternoon. Traffic moves along as snow falls in the 1000 block of Main Street in Hellertown Tuesday afternoon. A Hellertown public works truck spreads salt as snow falls in the 600 block of Main Street Tuesday afternoon. College Drive approaching William Street (near Saucon Park in Bethlehem) was a winter wonderland as snow fell Tuesday. A vehicle is stopped in the right lane of Rt. 378 northbound near the top of South Mountain in Lower Saucon Township. An often treacherous stretch of road in winter weather, Rt. 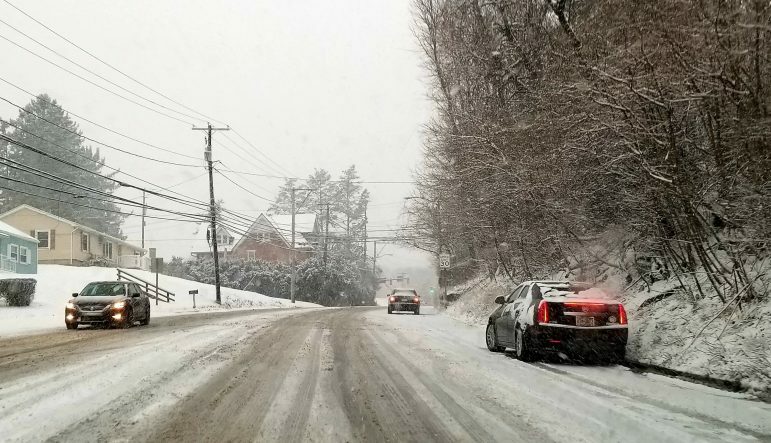 378 in Bethlehem and Lower Saucon Township lived up to its reputation Tuesday, when many motorists struggled to navigate the snow-covered roadway over South Mountain.